Participants will receive insights in the piezo inkjet process and accompanying topics such as ink design, printhead specifications, curing techniques, system integration and colour management. All information is presented in a neutral fashion and the theoretical sessions are interspersed with hands-on practical sessions in which some of the topics are highlighted in small teams. The main focus is put on all aspects that have to be taken into account when someone longs to integrate a digital inkjet printing process in an industrial production line. The participants will be able to decide for themselves if and to what level inkjet printing technologies can be applied in their own production process chain. The practical training will be offered in small teams (max. 3-4 people) and will highlight some of the topics that are discussed in the theoretical part. Each of the practical sessions will end with a question or task that is to be tackled by the teams in order to stimulate the assimilation of the subject matters. At the end of the course some time will be foreseen to go over these questions in group and to discuss the answers in an interactive way. 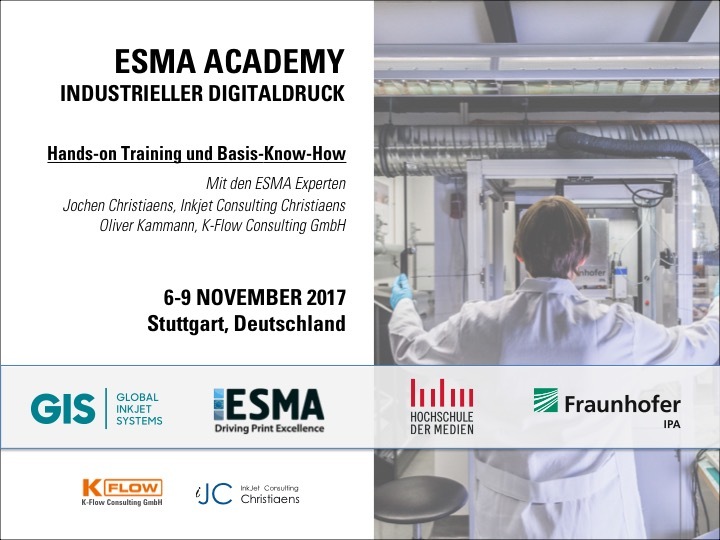 Die ESMA Experten Jochen Christiaens und Oliver Kammann organisieren erneut in Kooperation mit dem Fraunhofer IPA Institut und die Hochschule der Medien die Hands-On und Basis Know-How Akademie zum Thema industrieller Digitaldruck. An English Version of the ESMA ACADEMY is scheduled for November 2018! 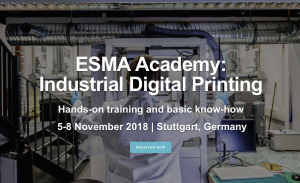 The ESMA experts Jochen Christiaens and Oliver Kammann, are organizing the second edition of the Hands-On and Basis Know-How Academy in cooperation with the Fraunhofer IPA Institute and the Hochschule der Medien, on the subject of industrial digital printing and invite you for the english course scheduled for November 2018. • requiring a solid overview of digital printing technologies, especially piezo inkjet, who want to decide if and in which Framework inkjet printing or another digital printing technology can be meaningfully for their manufacturing processes. • seeking neutral and basic know-how about inkjet technology or want to get into inkjet printing and will need to make investment decisions based on their technological knowledge. • planning an entry into inkjet printing or already have made, but are still at the beginning. In case of questions or registration do not hesitate to contact us. Join us for the new trends in Hollow and Flat Glass Decoration at GlassPrint Conference in Düsseldorf by ESMA vzw. For more details follow the link to the program. Veröffentlicht am 13. September 2017 Schreibe einen Kommentar zu 4th Edition of The Inkjet Conference to become biggest ever! Veröffentlicht am 1. August 2017 1. August 2017 Schreibe einen Kommentar zu JOCHEN CHRISTIAENS PROMOTING GROWTH OF UV LED CURING COMMUNITY IN EUROPE. 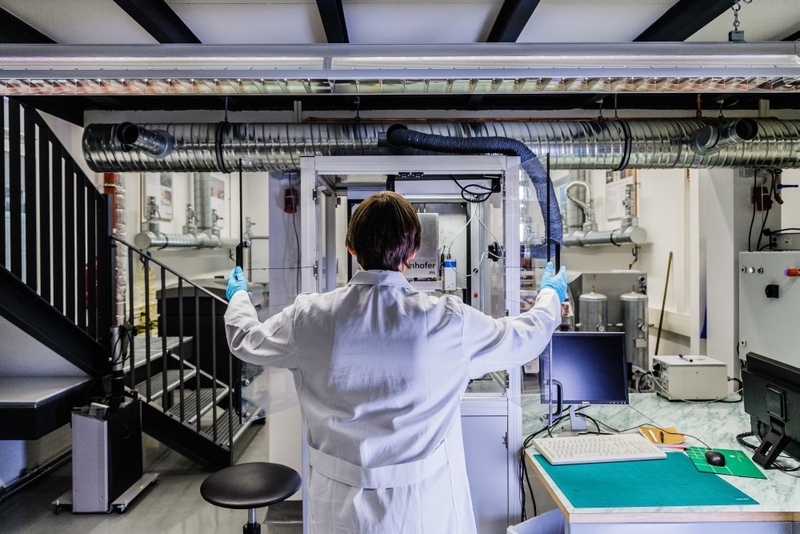 In cooperation with Fraunhofer IPA, Hochschule der Medien and with sponsorship support from Global Inkjet Systems, ESMA launches the brand new Academy project to offer basis know-how and certified hands-on training in industrial printing techniques. The first course is offered in German, focuses on inkjet and takes place on 3-6 July 2017 at Fraunhofer IPA facilities in Stuttgart. The lab capacity is limited to 21 participants.